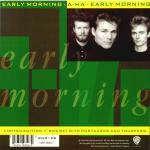 The 7" has a large green block a-ha-logo on an olive coloured background, while the title "Early Morning" is written in filmy letters across the mid-section of the sleeve. A black and white 2�"x4" band-shot by Knut Bry is placed in the upper right corner (identical to the one featured in 7"x7"-size in the limited edition UK EP-release of "I Call Your Name"). 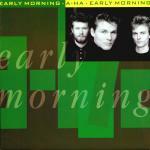 "Early Morning - A-HA" is written in alternately yellow and green letters on a yellow and green strip across the top section of both the front and the reverse of the sleeve. In addition to the same features as the front, the reverse has a small picture advertising the "East Of The Sun, West Of The Moon"-album, plus track listings in yellow and white letters. The 7"-single also comes in a limited edition box-set. The print on the lid of the box is identical to the picture-sleeve, while the rest of the box is white. The box contains a German 7" sleeved record, three black and white postcards featuring the band members plus a red, laminated "Access All Areas" -tour pass. The 12" has the same front sleeve as the 7". The reverse of the sleeve is slightly different from that of the 7" with "Taken From The Album East Of The Sun" written above the picture of the album rather than underneath. It features the additional track "Train Of Thought" from the album "Hunting High And Low". The 5" CD has front cover like the 7"-single and has the green background design continuing round the spine with the titles written in yellow. 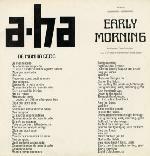 The back of the insert has a black background with a large black a-ha-logo and black and grey "Early Morning" titles. Track listings are printed in white and there is a small picture of the album. The CD has a grey a-ha-logo on a black background and silver titles. The CD has the same tracks as the 12". 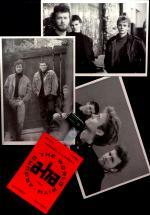 The cassette single has cover similar to the 7" with the large green a-ha-logo and Early Morning-title continuing round the spine and flap of the insert. In addition, the front of the sleeve has "Cassette single" written in white capital letters across the middle. The spine has yellow titles and on the fold-out flap the tracks are printed in yellow and there is a small picture of the "East Of The Sun West Of The Moon"-album. The cassette is white with titles printed in black and it plays the same on both sides of the tape. Brazil: There is a unique white sleeved 12" promo which is plain except for the text "a-ha Early Morning" plus the song lyrics printed in Spanish and English. Both sides of the sleeve are the same. It features the regular version on both sides of the disc, one side plays at 33 RPM, the other at 45 RPM. On the sleeve of this 12", Magne's surname is spelt incorrectly as "Furuholmer"! Germany: The 5" CD has the same sleeve as the UK edition but the disc itself is black with silver titles. Some promotional copies of the German 7" come with a product fact sheet with information on the band plus the German tour dates. Mexico: The Mexican promo of "Early Morning" comes in a white record company promotional sleeve. It has the same track on both sides (to be confirmed) which is listed as "Temprano En La Manana". Philippines: There is a promo 7" which doesn't have a picture sleeve.